As writer / editor / publisher, I manage the media site KQEK.com to which I’ve contributed more than 1500+ film reviews, 300+ soundtrack reviews, and podcast interviews archived at iTunes, Libsyn, SoundCloud, and YouTube. As one of Rue Morgue Magazine‘s longtime writers, I’ve similarly contributed reviews, interviews, profiles, blogs, and buyer’s guides. Prior media writings have appeared in Canadian Screenwriter, Film Score Monthly, and Music from the Movies. I also publish the filmmaking site Big Head Amusements, which features making-of details on my various film and visual art projects, practical info on blending vintage SD analogue with modern HD video gear, and links to archived samples on Vimeo and YouTube. In 2013, I was invited by Toronto’s Black Museum to conduct a lecture, “Black Give Ballads: The Art of the Italian Giallo Soundtrack.” I also edited supporting montages of music and film extracts, and the lecture’s contents are currently being expanded into a book project. 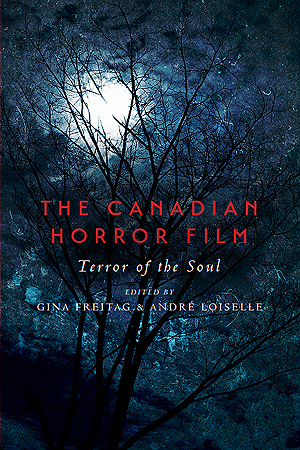 My interest in / modest obsession with Can Con films resulted contributing the chapter “Rituals (1977): Creating the Forest Slasher within the Canadian Tax Shelter Era” for upcoming textbook Canadian Horror Film: Terror of the Soul, edited by Andre Loiselle with Gina Freitag, slated for a fall 2015 publication by U of T Press.